Uganda acquires two Airbus A330-800Neo worth $20 million as it moves to revive its national carrier. Uganda has secured two Airbus A330-800Neo worth $20 million as it moves to revive its national carrier, Air Uganda. Monica Azuba Ntenge, Minister for Works and Transport, revealed on April 8 that the payment—$10 million for each aircraft—was made on April 5, firming up the order, which had been pending since July 2018. M/s Monica Azuba Ntenge, Uganda's Minister for Works and Transport trying hard to buy the aeroplanes. According to the minister, Uganda had to act fast or risk losing the order and any monies that had been deposited with Airbus, after missing the February 2019 deadline to deposit at least 30 percent of the purchase price. Ms Azuba said the payment too saved Uganda from price escalation and the $0.8 million which it had already paid to Airbus in commitment fees last August, shortly after Uganda Airlines signed a memorandum for the purchase of the smallest variant of the redesigned A330. According to Airbus, the A330-800 – one of two A330neo versions, along with the A330-900 – is a more efficient aircraft that will generate savings through its reduced fuel burn. The A330-800 typically will seat 257 passengers in three classes of service, while offering capacity for up to 406 travellers in a high-density configuration. The jetliner incorporates the latest-generation Rolls-Royce Trent 7000 engines, along with multiple aerodynamic improvements. Ms Azuba added that the Ugandan order is expected to appear in Airbus’ sales figures for April. Another payment is due in October 2019 and a further one in October 2020, when the first A330 is expected to be handed over. The other one is expected in early 2021. Uganda Airlines plans to use the two aircraft for the second phase of its growth plan, with flights to the United Kingdom and the Far East. Uganda Airlines is scheduled to start commercial services in June and has announced plans to operate 19 intra-African routes in the first phase. Ephraim Bagenda, the interim chief executive, says during this period, the carrier will negotiate interline agreements and code-share with some of the bigger foreign airlines operating into Entebbe, to offer onward lift to transit passengers across its network. One hopes that initially these international flights will consist of passangers and cargo to be able to run them profitably as Uganda Airlines used to do some years back. Uganda Airways First plane arrives next month, March 2019. The first aircraft for the the revived Uganda Airlines is expected to arrive in the country in a month's time. The minister for Works and Transport, Monica Azuba Ntege says that the pilots of the Bombardier CRJ900 jet were sent to Canada for training. Azuba said they are supposed to meet with manufacturers to iron out a few issues and set date when the first jet will be delivered. "That was the first flight test and they are still doing more test flights," Azuba said. "It due to come this month or next month. We are having a meeting which will set the date when we will receive it. So anytime within a month, it will be here." 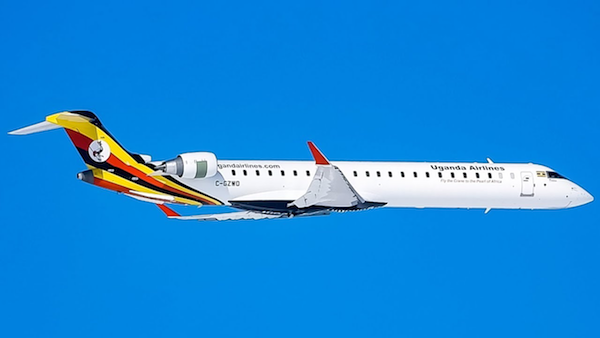 Last year, Uganda ordered for four CRJ900 regional jets as part of the much-anticipated plan for the revival of Uganda Airlines. The revived airline will be the first carrier to operate the new CRJ-series atmosphere cabin in Africa. Atmosphere cabin design allows passengers to carry and store an "oversized" roller bag within the aircraft cabin bins which minimizes the need to check bags at the counter or the gate. The airline will operate the CRJ900 in dual-class configuration with 76 economy seats and 12 first class seats. According to the manufacturer, the new model atmosphere cabin sets new standards of passenger experience in the regional jet market segment. Key features of the new interior comprise of larger passenger living space, wheel-first roller bag capability, more spacious lavatory, increased cabin connectivity options, all integrated into a contemporary design and material choices. The first Bombardier was supposed to be delivered last month. But there were changes in the programme. The initial plan was that the manufacturer would be delivering a jet per month starting January. This arrangement will be followed after delivery of the first aircraft. Here on continent Europe, one sees private airways companies owning and managing 200 Aeroplanes every other day. One is of the hope that these African national airlines will amalgamate to form large scale international economies of transport across the continent with the privilages that go with the African Union. Such an economic unification can fast track air transport development on the African continent in fair competition with the rich foreign airways companies. NGA tujaguza emyaka 56 egy’ameefuda, Uganda eyise mu kusoomoozebwa mu bintu bingi wadde nga era waliwo bingi ebituukiddwako. Ekitundu ku luguudo lwa Entebbe Express Highway olw’okusasulira. We twogerera kati abantu 70 ku buli 100 basobola okusoma n’okuwandiika kyokka ekibi abasinga obungi ku bano tebalina mirimu gya mu mutwe gisobola kubayimirizaawo. Amasomero ga nnasale galinnye okuva ku 5,763 mu mwaka gwa 2016 okutuuka ku 6,798 mu mwaka gwa 2017 nga n'obungi bw'abayizi abatandika mu nnassale bulinnya mu kiseera kye kimu okuva ku 477,123 okutuuka 563,913. N’abayizi mu masomero ga pulayimale beeyongedde obungi okuva ku 8,264,317 mu 2016 okutuuka ku 8,655,924 mu mwaka oguwedde Abayizi abali mu masomero ga siniya nabo beeyongedde obungi okuva ku 1,284,008 mu mwaka gwa 2016 okutuuka ku 1,457,277 omwaka oguwedde ng'abo abali mu nkola ya Bonnabasome eya Universal Secondary Education (USE) baalinnya okuva 912,394 mu mwaka gwa 2016 okutuuka ku 952,539 omwaka oguwedde. Okutwaliza awamu ebyobulamu kukyali kusoomooza kwa maanyi eri eggwanga, gamba nga mu malwaliro obutabeeramu ddagala, omuwendo gw’abasawo okubeera omutono ennyo bw’ogerageranya n’abantu abeetaaga obuweereza. Okubalirira okwakolebwa mu mwaka gwa 2014, kwalaga nti mu ggwanga mulimu amalwaliro amanene 147, ate agali ku mutendera gwa Health Centre IV gali 188 nga kino kivaako abantu okutambula ehhendo empanvu, naddala abakyala abazaala, okutuuka awali obujjanjabi. Wabaddewo okugenda mu maaso okuziyiza endwadde ezitta ennyo naddala abaana abato nga gavumenti eyita mu kugema abaana olukusense, ekifuba ekiraakiira, ekiddukano, wamu n’okugaba obutimba bw’ensiri kyokka nga era obwetaavu bukyali bwa maanyi naddala okubunyisa ebitundu by’eggwanga obutimba bw’ensiri okuziyiza omusujja. Endwadde ez’amaanyi nga ez’emitima, kookolo, kukyali kusoomooza kwa maanyi mu byobulamu olw’obutaba na byuma bimala mu ggwanga okuzijjanjaba nga kino kiwaliriza abantu okugenda ebweru okujjanjabwa ku nsimbi ennyingi ennyo, bangi ku Bannayuganda ze batasobola kufuna. Wabula Dr. John Omagino akulira eddwaaliro ly'emitima erya Uganda Heart Institute agamba nti endwadde esizinga ezeekuusa ku mitima basobola okuzijjanjabira wamu mu Uganda ng’omuntu kimwetaagisa okusasula ensimbi wakati wa 5,000/- ne 20,000/- doola za Amerika. Amalwaliro agalina ebyuma ebikebera omusaayi (Laabu) beeyongedde obungi nga mu mwaka gwa 2014 gaali ebintu 99 ku 100 nga zisobola okukebera endwadde ezisinga okutawaanya Bannayuganda okuli omusujja n’endwadde endala. Obungi bw'abakyala abafiira mu ssanya bweyongedde okukendeera okuva ku 109 okutuuka ku 53 ku buli bamaama 1,000 okuva mu 2006 okutuuka mu 2016 wadde nga wakyaliwo okusoomoozebwa olw'abaana abafa mu kuzaalibwa abakyala 336 ku buli 100,000 abazaalibwa okusinziira ku kunoonyereza okwakolebwa mu 2016. Kyokka wakyaliwo okusoomoozebwa kw’abakyala bangi abatafuna bujjanjabi bwetaagisa ng’okubeera ewala n’amalwaliro, eggwanga obutaba na bakugu bamala abakola ku ndwadde z’abakyala, n’abaana abawala abafuna embuto nga tebanneetuuka. Okutwalira awamu wakyaliwo ebisoomooza bingi ku byenfuna by’eggwanga naddala ebbula ly’emirimu mu bavubuka, ensimbi ya Uganda okubeera ennaabuufu bw’okigeraageranya n’ez’amawanga ag’ebweru naddala gyet uggya ebikozesebwa. Ebintu ebisinga bye tukozesa mu ggwanga bikyava bweru, ekiviirako eggwanga okufulumya ensimbi ennyingi ezandikoze ku bintu ebirala ebikulaakulanya eggwanga n’okulongoosa obulamu bw’abantu babeere mu mbeera ennungi. Kyokka waliwo kaweefube wa gavumenti okwongera ku bintu ebitundibwa ebweru w’eggwanga okugeza ng’emmwaanyi. 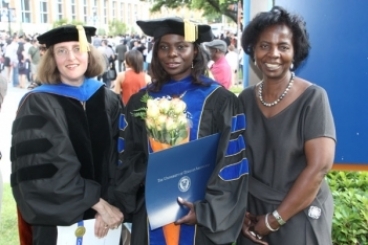 Minisita avunaanyizibwa ku byobulimi Vincent Bamulangaki Ssempijja agamba nti, gavumenti eyagala Uganda ebeere ng’etunda ensawo z’emmwaanyi obukadde 20 mu mwaka gwa 2025 we gunatuukira, nga mu kiseera kino tutunda ensawo obukadde 4. Kkiromita eziwera 5000 ez’enguudo mu Uganda ze zaakakubwa koolansi okwetooloola eggwanga lyonna ate kkiromita 10,000 ziyiiriddwa malamu. Kyokka wadde kino kiri kityo, enguudo ezisinga obungi mu ggwanga zikyali mbi nga n’ezikoleddwa za mutindo gwa wansi ezoonooneka amangu olw’abavunaanyizibwa okubba ensimbi ne bakola omulimu ogutali ku mutindo. Entambula ekyakaluubiriza nnyo abantu olwa gavumenti okuggya enta mu by’ensaabaza y’abantu n’ebirekera abantu n’amakampuni ag’obwannannyini ekivaako buli kiseera okupaaza emiwendo nga bwe baagala. Kkampuni ezaali eza gavumenti nga UTC, Uganda People’s Transport zaggalwa. Wadde ng’amabibiro geeyongeddeko, naye wakyaliwo okusoomoozebwa nti emiwendo gy’amasannyalaze gikyali waggulu nnyo. Mu bitundu eby’ebyalo tennatuuka masannyalaze ate nga ne bwe ganaatuukayo, abantu tebalina busobozi bugeetuusaako olw’ebbeeyi ennene kwegali. Ate sebo toyogede ku Solar asanide okukwatagana namasanyalazze agamabibiro. Gwe ate amasanyalaze ga Solar gatuli kunyindo zaffe. Tegali wala nyo. Buli lunnaku Omusana gutwakira. Ebibira, emigga, okulima ne nkuba bilabika biyimiridde kunsonga eno empya eya technology eze okuyamba enyo ebizibu by'ensi Buganda mpozzi era ne Uganda! Sometime in 1999, veteran journalist Charles Onyango-Obbo in his “Ear-to-the ground” column in The Monitor newspaper described Uganda Airlines as a “flying coffin”. At the time there was public outcry over the airlines as it had been mismanaged. During the privatisation of public enterprises, the Uganda Airline Corporation was not spared. Unfortunately, the privatisation process of the airlines was “fraudulently conducted”. In August 1999, Parliament of Uganda instituted a special committee to investigate the privatisation exercise in the country. The committee was tasked with looking at specific enterprises that had caused public outcry because of how they were privatised, specifically the Uganda Commercial Bank, Transocean, Uganda Airlines and Entebbe Handling Services (ENHAS). On November 2, 1999, under the motion ‘The final report of the select committee on the privatisation process’ chaired by Mr Aisu Omongole, the report was tabled to the Parliament. Parliament heard that on November 23, 1993, the Civil Aviation Authority (CAA) had invited inquiries in a public notice. Services listed included aircraft, cargo and passenger handling which were being provided by Uganda Airlines Corporation. 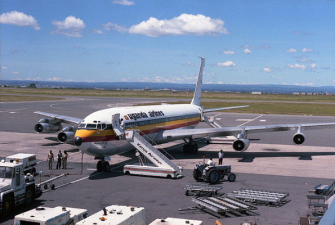 The investigations discovered that while Uganda Airlines Corporation was to be privatised, there was almost nothing to sell apart from three old planes, including a C-130 owned by the Uganda Air Cargo Corporation, both started by former president Idi Amin in the 1970s. “Most often, members well-placed in the both in this regime [NRM] and other regimes were using this plane. They would use it for their private errands without paying for the plane,” the report said about the C-130 aircraft. Investigations also discovered that during the privatisation exercise there were disagreements between Uganda Airlines and the directors of Global Airlinks and Efforte, which resulted in the termination of the contract of the Uganda Airlines Corporation board. After which, the minister of Works, Transport and Communication appointed the managing director of Caleb International to lead Uganda Airlines. Caleb International and Efforte companies were owned by then Maj Gen Caleb Akandwanaho, aka Salim Saleh, President Museveni’s younger brother, while Global Airlinks was owned by minister Sam Kutesa. “The committee noted that contrary to the PERD [Public Enterprises Reform and Divestiture Act] statute, the minister of Works, Transport and Communication and CAA went ahead and privatised Uganda Airlines Ground Handling asset. The then minister was Kirunda Kivejinja. This was a deliberate breach of the law for which the minister of Works, Housing, Transport and Communications should be answerable. The minister in charge of privatisation [Manzi Tumubweine] was fully aware of this illegality but made no attempt to halt it,” the report reads. While Uganda Airlines was on ‘drip’ as government was spending approximately Shs33 million per day to keep it in the air, minister Kirunda Kivejinja sold all the Uganda Airlines routes, the 6th Parliament heard. “The committee was disturbed to learn that the minister of Works, Transport and Communication arrogated himself the responsibility of privatising Uganda Airlines routes without consulting the PU [Privatisation Unit], neither did he consult the CAA whose legal mandate is to designate these routes. The committee noted that without routes, ground handling operations or in-fright catering service, Uganda Airlines has been left as a shell and in unattractive to buyers,” the report reads. The committee wondered how Efforte, a company owned by Gen Salim Saleh, took control of in-flight catering services at Entebbe airport, and later in partnership with Global Airlinks owned by Mr Kutesa took over Uganda Airlines Ground Handling operations. MP for Chwa County in Kitgum District, Livingston Okello Okello, was the first to take to the floor. “Mr Speaker, I am not a soldier, but I think some of us are too shocked to carry out any debate now, having heard what is contained in this report. I think we need to recover from the shock of the report before we can start debate tomorrow,” Mr Okello Okello said. “We are ruining our country, corruption is eating us away and I do not know when we are going to wake up and deal with it. I was in exile and I do not want to go into exile once again. People get so frustrated when they read reports like this and if there is a change, people run to our homes and start killings us and burning down our houses,” he added. The following day, November 3, 1999, Eddie Kwizera, MP for Bufumbira East in Kisoro District, was the first to take the floor. That very afternoon, minister of Finance, Planning and Economic Development in-charge of Privatisation, Manzi Tumubweine, addressed MPs. “Honourable members will recall the various meetings we held on the divestiture of the Uganda Airlines Corporation. The suggestion to improve the draft agreement for divestiture of 49 per cent of Uganda Airlines to South Africa Airways was very useful,” he explained. “In the meantime, government is finding it extremely difficult to procure funds for payment of IATA [International Air Transport Association] bills. Today, we still have the August bills which are actually $773,000. Uganda Airlines and South African Airways merger was meant to redeem Uganda’s national air carrier, but it was never to happen. On December 16, 1999, minister Tumubweine updated Parliament on the progress on selling of the airlines to South African Airways. “Mr Speaker, on Wednesday, December 8, 1999, Hon Kweronda Ruhemba, the Minister in charge of Economic Monitoring, promised this House that I would be coming up with a statement to brief members on the status of the divestiture of the Uganda Airlines when negotiations with the South African Airlines are finalised. I am now able to give you this statement. Unfortunately, South African Airways pulled out of the deal. One of the reasons they gave was the “merger with other entities” closure. With South African Airways quitting the merger, it was the equivalent of switching off a generator during a medical operation. Uganda had no option but to sell the three planes – a C-I30, a Boeing 737 and Fokker Friendship – to pay debts. And that is how Amin’s brainchild died. 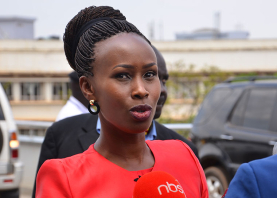 Barbie yasemberedde bba eyabadde alabika nga munafu nnyo n’ayagala okumugwa mu kifuba. Wano we yatendewaliddwa n’agwa wansi wakati mu maziga. Yabadde ne Eddie Yawe muganda wa Bobi Wine eyamuyoddeyodde okumuggya wansi. Ate olwo Yawe naye n’adda mu maziga. Barbie (ku ddyo) ne ssenga we. Erias Lukwago gwe baagenze naye nga looya wa Bobi Wine yasoose kunyeenya mutwe ate naye n’abeegattako okukulukusa amaziga. 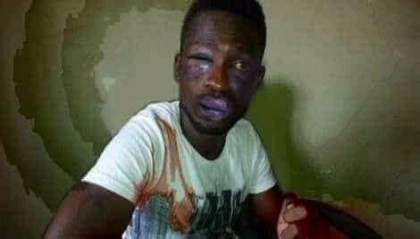 Bonna abaagenze okulaba Bobi Wine okuggyako Hajji Meddie Kaggwa ow’ekitongole ky’eddembe ly’obuntu bazze mu kukaaba. Eggulo ku makya baasimbudde okugenda okulaba Bobi Wine era ku mulyango gw’ekkomera e Makindye baasanzeeyo abantu abalala okuli ababaka ba palamenti abaakulembeddwa akulira oludda oluvuganya Betty Aol. Kyokka abamagye bakkirizaako abantu batono, abalala ne balindira wabweru. Lukwago oluvannyuma yategeezezza Bukedde nti Bobi Wine baamusanze ali mu bulumi kyokka ng’asobola okwogera empolaampola. Yabadde awulubadde mu maaso, ng’azimbye emikono era ng’awulira obulumi obw’amaanyi mu mbiriizi, omutwe, amagulu n’obutuuliro. “Atunyumirizza nti baamukuba nnyo. Ekisenge mwe yali kyalumbibwa abamagye nga 15 nga balina emmundu. Ne bakuba oluggi n’aggulawo ne bayingira”, Lukwago bwe yategeezezza ng’annyonnyola ebyamubuuliddwa Bobi Wine. Lukwago yagambye nti Bobi Wine yeewaayo era teyalwana. Kyokka bo baatandikirawo okumukuba nga bakozesa ebigala by’emmundu, okumusamba buli we basanze. Baamussa mu mmotoka ne bagenda nga bamukuba okutuuka mu nkambi y’amagye e Bondo mu Arua. Bino byaliwo ku Mmande ekiro. Bwe bwakya ku Lwokubiri ng’ali bubi ne bamutwalira omusawo w’amagye eyamukolako n’asemba bamudduse mangu mu ddwaaliro kubanga embeera yabadde mbi nnyo. Kwe kumussa ku nnyonyi ne bamutwala mu ddwaaliro ly’amagye e Gulu gye baamuggye okumuvunaana mu kkooti y’amagye nayo eyatudde mu nkambi. Yagguddwaako emisango gy’okusangibwa n’emmundu n’amasasi nga si muserikale. Lukwago yagambye nti Bobi Wine yamutegeezezza nga bwe baamukubye empiso kyokka nga kyabadde tekinnamanyika oba zaabadde za kumukkakkanya bulumi. Yagambye nti abamagye baasuubizza okutwala Bobi Wine mu ddwaaliro eddene bamukolero Xray n’ebirala. Ajja kuzzibwa mu kkooti y’amagye e Makindye ku Lwokuna olujja nga August 23. Okugenda e Makindye Barbie yasimbudde ewuwe e Magere kyokka emmotoka n’agireka Kamwokya awali kye bayita ekitebe kya Bobi Wine n’alinnya bodaboda okwanguwa okusisinkana balooya okweyongerayo e Makindye. Oluvannyuma lw’okugaanibwa okuyingira e Makindye, ababaka nga bali n’akulira oludda oluvuganya mu palamenti baagenze ku kkooti y’amagye e Makindye okuwaayo ekiwandiiko ekisaba okubakkiriza okulaba Bobi Wine. Banange M7 nebasajja bo abantu ba Africa okuba eno bwobatta lwaki? It was all the fault of politicians that stopped this infrastructure which is essential to the survival of this country. Uganda is land locked and massively surrounded by inland territories of other African countries. It is a phenomenon that can never be neglected. Government is in advanced stages of procuring two more aircraft, as efforts to revive Uganda Airlines hit overdrive. Earlier on Wednesday, Canadian plane manufacturer, Bombardier announced that it has signed a purchase agreement with Uganda for four CRJ900 aircraft. The four bombardiers will cost an estimated $190 million (about Shs 711 billion). And, today European company, Airbus in statement, confirmed the signing of memorandum of understanding between itself and Uganda Airlines for the purchase of two A330-800neo aircraft. This means the national carrier which is being revived, will have 6 planes. Cabinet early this month concluded discussions on revival of the national carrier. The two A330-800neo aircraft will each feature, according to the statement, three class cabin layout comprising of 20 Business seats, 28 Premium Economy and 213 Economy seats. “This agreement demonstrates our ambition for economic growth supported by a robust aviation industry. The A330-800neo combines low operating costs, long range flying capability and high levels of comfort. We are looking forward to launch operations and offer our customers best-in-class service”, said Ephraim Bagenda, CEO of Uganda Airlines. 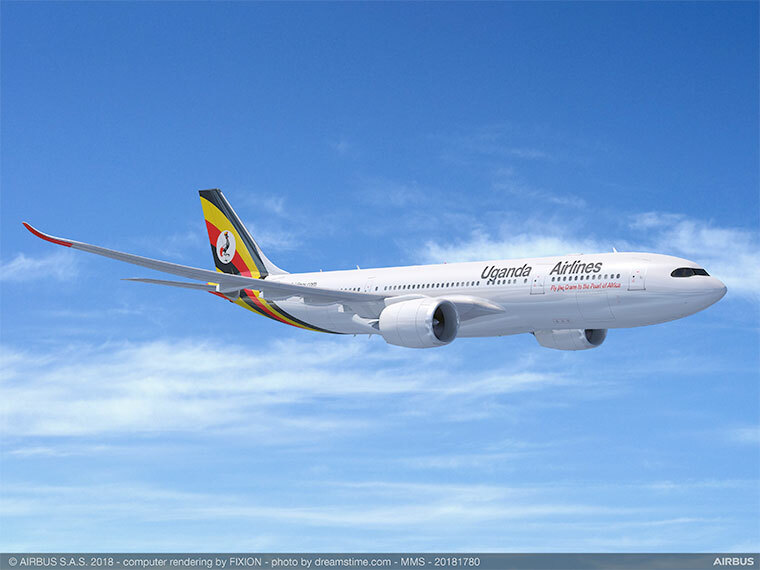 “We are delighted to welcome Uganda Airlines among our A330neo customers, the A330neo will bring a range of benefits offering unrivalled efficiencies combined with the most modern cabin. We look forward to see the A330-800neo flying in the colours of Uganda”, said Eric Schulz, Airbus chief commercial officer. Government had set December 2018 as the date for Uganda Airlines to resume operations, but this has been pushed to April 2019. Government needs at least Shs 1.3 trillion to purchase the six aircraft but only Shs 139 billion was budgeted for in 2018/19 financial year. Recently, State Minister for Planning, David Bahati said government was looking at acquiring loans from banks including China's Exim bank among other investment possibilities. Revamping Uganda Airlines was top on President Yoweri Museveni's must-do list after 2016 presidential elections. During the inauguration of the cabinet in October 2016, Museveni directed the line ministry to commence work on the task. Museveni argued that "a national airline would help the country save $420 million per year that Ugandans spend on air travel with foreign owned aircraft. Uganda Airlines started operations in 1977 and wound up in May 2001. It is high time this government brought out the old crew who did a great job of running the old Uganda Airlines as the country struggled with incessant civil wars that gripped this country. Their example of hard work equals that of the African crew of Ethiopian Airlines. One is well aware that some of the old crew are old age and need their retirement. But training, advising and sharing experiences and skills in this very competative international business environment is essential for the young African professionals that are going to take on the duty of flying the Airline flag.